First Light – Monument Valley - Together, We Make Memories! Dawn arrives at Monument Valley in this view from Hunt’s Mesa. 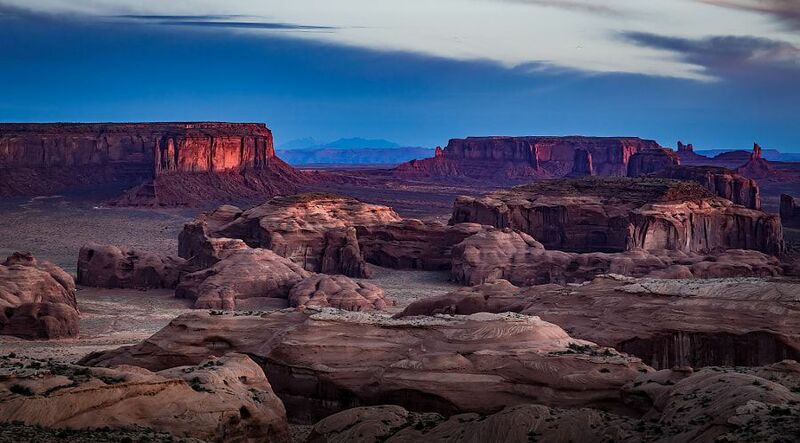 It’s a long, precarious drive up in a high clearance four wheel drive vehicle, with a Navajo guide, usually done the day before, in order to shoot the sunset, which is also breathtaking. You can overnight, with a five o’clock wake-up in order to dress, grab a cup of coffee, get the camera gear together and trudge out to the northernmost point. It can get pretty cold, depending upon the time of year, and there is usually some fumbling with gloved fingers as you adjust your tripod and the camera controls, getting ready for the shot. This view makes it all worth it.This fine art image by Pat Kofahl is available in multiple sizes on paper, canvas, metal and plexiglass. Prices start at $49.00!